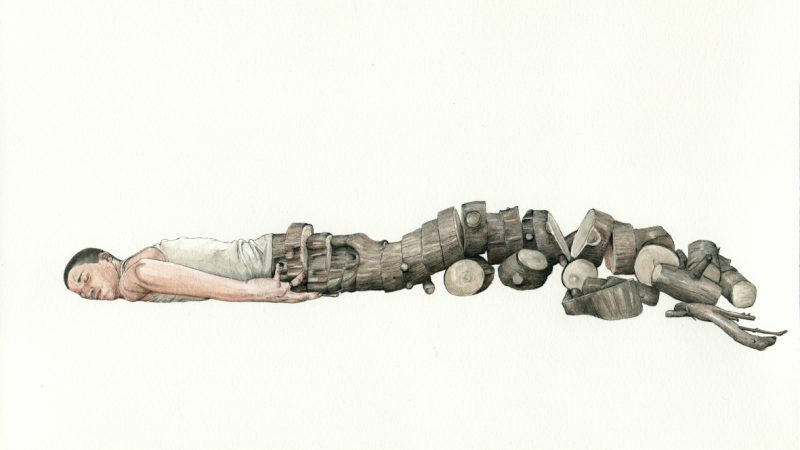 Fabien Mérelle is known for his elegant and delicate line-drawings in black ink and watercolour. His detailed and precise works exude a humble character, but it’s by examining up close that the complexities of his imagination are revealed in a rich and personal story. What at first glance is a beautiful drawing that stirs the spectator through an impressing dedication and patience in style, appears to be much more than that. The quietness of his style permits an amazement about the depth of his subject matters. He draws from his subconsciousness, dreams and uninhibited imagination to create layered, mysterious scenes. As the images are set in a white, clear background, everything happens inside the image, between the lines and invites the audience deeper into his world. We soon discover that innocence is lost but we receive an awakening of our own imagination instead. We get more than we bargained for and leave full of questio. Fabien Mérelle graduated from the Beaux-Arts Academy in Paris in 2006 and attended the Beaux-Arts Academy in Xi’An, China in 2005 where his style got heavily influenced by Eastern drawing techniques and he perfected the use of Chinese ink. The famous Albrecht Dürer fed his passion for accurate anatomical rendering. The seemingly incompatible nature between his demure and almost classical style and his at times dark, confronting, psychological, ironic, disturbing,.. but also sensitive depictions leave us bewildered and intrigued at the same time. When Mérelle returned from China, he was granted another residence at the highly esteemed Casa Vélasquez, Madrid in 2009 and in 2010 he won the highest prize in the Canson Art School Awards. His work has been exhibited at The Armory Show, New York and Paris, the Praz-Dellavade gallery, Paris, Guy Bärtshi gallery, Geneva,… and has appeared in multiple publications and is part of the Daniel and Florence Guerlain foundation, Paris. Mérelle was born at Fontenay-aux-Roses, France in 1981 and lives and works in Tours and Paris, France. Fabien Mérelle, Panamarenko, Antoine Roegiers and Jan Fabre are part of the group exhibition 'Hommage to Leonardo da Vinci' at Château du Rivau, france. Fabien Mérelle was invited by the 'centre de création contemporain olivier debré' in Tours, France, for a new solo exhibition 'abri, pierre, bois, encre, papier'. Fabien Mérelle's work 'Marine, où fuir les idées nauseabondes...' is part of the group expo 'The Sensation of the Sea' - in honour of Bas Jan Ader at Mesdag Collection Den Haag, the Netherlands. A major group exhibition in Ostend, Belgium, curated by Jan Fabre and Joanna De Vos.